Ethan Hawke here to save the day (or not)! What do you get when you cross the smarmy pseudo-intellectuality of Aparna Sen, the manipulative political correctness of Precious, with a dash of shock value a la Alpha Girls? The answer is The Purge, which just opened a couple days ago. 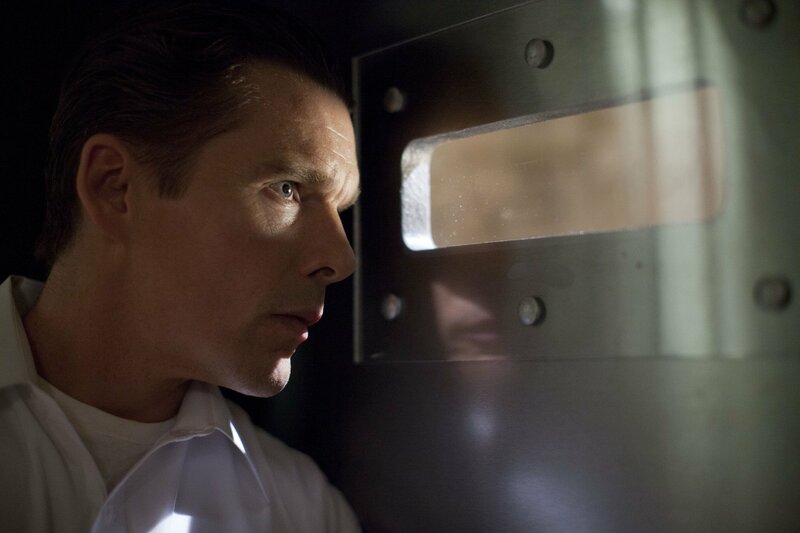 The Purge follows the Sandin family, led by James (Ethan Hawke), a security system salesman, as they wait out (you guessed it) the purge, in which all crime is legal for 12 hours. The very premise of the movie, which may sound clever on paper, is already a problem. It is meant to be a “haves vs. have-nots” allegory where the movie leads us to believe the titular purge is a way for the poverty-stricken parts of America to annihilate themselves, only to negate itself by showing the rich people committing the chaos. When the purge actually started, the movie very quickly descended into suffering the same syndrome as Ferat Vampire in that it had no idea what it wanted to be. Horror movie? Action movie? Political allegory? The plot went absolutely nowhere. I spotted the ending almost as soon as the movie began. The son existed almost purely to be someone to create the toy camera-tank thing. Why was it necessary? Almost purely so the movie can make a very narcissistic homage to Paranormal Activity, whose creators also brought us The Purge. It may have been in an attempt to keep us from rooting for these rich people, but I just found the central family to be really annoying. It got to a point where I actually wanted someone to kill the son (Max Burkholder). He shouted for his mother (Lena Headey) in what could easily have been the most annoying voice a movie character could have. Besides one very contrived “crisis of conscience” scene, I detected zero growth in any of the Sandins. The opening scenes show the Sandin family with its stereotypical “rich person” fetishes of things like maintaining physical slimness and academic excellence for its children. In addition, you have a homeless guy (Edwin Hodge) who was off-screen most of the time, had fewer lines of dialogue than Boba Fett in the original Star Wars trilogy for the whole movie, and served absolutely no purpose besides being a convenient racial stereotype and a deus ex machina when the movie ran out of ideas as to how to keep the plot moving. We never even find the guy’s name out. The movie was also just too much in my face to be an effective allegory. I felt The Purge really underestimated my intelligence as a viewer in that the movie really tried to shove its political message down my throat instead of letting me figure it out on my own. The Sandins watched newscasts toward the beginning where interviewees were spelling out exactly what the movie wanted you to take away. It’s almost as if the writers suddenly realized just before shooting that they wrote in nothing about how the purge was affecting society, so they had to get that scene in, and thus broke the central tenet of “show, don’t tell” in movie writing. While I was admittedly unimpressed by Fast and Furious 6, it still accomplished what it set out to do, which The Purge did not. As the acting and technical competence was generally good, I would give The Purge an A for effort. However, I once again remembered that I’m an engineer and realize giving grades based on the old college try doesn’t fly. The Purge is already the worst movie of 2013 I have seen so far. The problem is that I fear despite it being a pretty lousy horror movie, I suspect it will do well in the box office by virtue of being a horror movie. Because of that and the utter lack of plot, I wouldn’t be surprised if a sequel were made.